Sadly the rockery stone didn't turn up today as planned. Apparently the person who took the order didn't bother to write down that they were to be delivered today, although strangely they did manage to take all the payment details and take that from my account. So to cheer myself up and so the day wasn't a total waste, I started to put plants out on the rockery. I find it easier when building a rockery like this, to set the plants out before the gravel and stone gets added. That way I can place the stone around the pots, and plant it up as I go. It is much easier than having to try to dig holes in gravel. I'm sorry about the photo, the light was all wrong, but it was so exciting to be placing plants. The cycad has to go in the middle and that will change the feel a lot, but it isn't quite right yet. 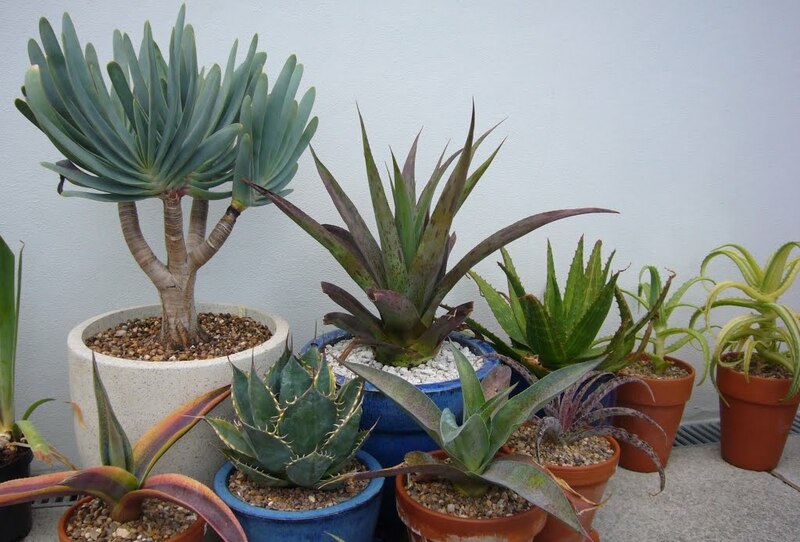 I may move the variegated yucca to where the agave bracteosa is at the back, then move the aloe striatula to where the yucca was, and then agave bracteosa to where the aloe was. No doubt there will be a few games of musical chairs until it is actually planted. 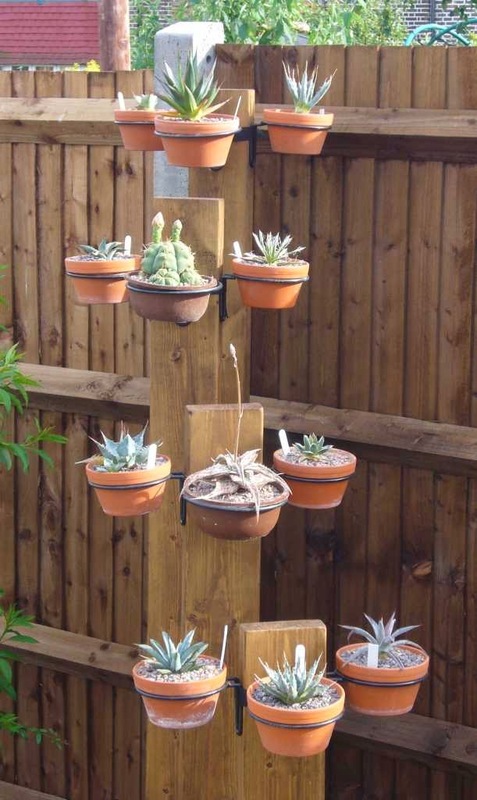 There are some echeverias ear marked for there as well, it will depend a bit on space. Currently I am thinking to keep this as a very neat bed, and not a more lush look, but a stream of blue echeverias running through it could look good. 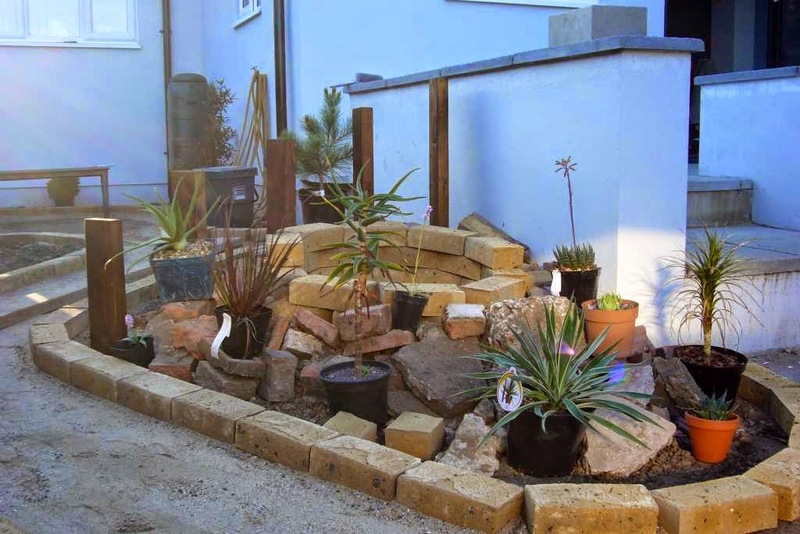 The big advantage to these types of rockeries is that large bits of concrete and stone should work as a heat sink and provide a bit of extra winter protection. I know by the time the cold arrives the heat will have gone, but even so plants against big rocks still do better. I also decided the vertical posts were too harsh without plants, so until the bamboo and tree ferns arrive, they make ideal vertical panters. It is great to have plants out in the garden and not just in pot storage areas.